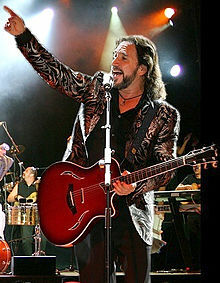 Marco Antonio Solís Sosa (born December 29, 1959) is a Mexican singer, musician, composer, actor, and record producer. Solís has been awarded five Latin Grammy Awards, two Lo Nuestro Awards, has a star on the Hollywood Walk of Fame, and has been inducted into the Billboard Latin Music Hall of Fame. ↑ Lannert, John (April 29, 2000). "Billboard's Latin Music Hall of Fame Inductee: Marco Antonio Solís". Billboard (Nielsen Business Media) 112 (18): 22. ISSN 0006-2510. https://books.google.com/books?id=EA8EAAAAMBAJ. Retrieved July 14, 2017. This page was last changed on 29 April 2018, at 23:01.